Writers Guild of America Theater. 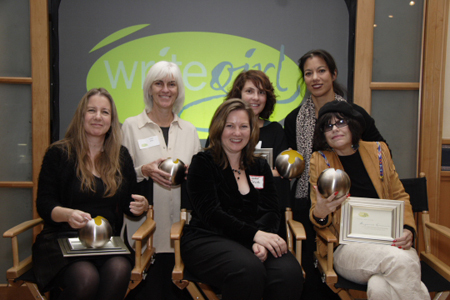 The 2011 Bold Ink Award honorees, left to right: Nia Vardalos (My Big Fat Greek Wedding, I Hate Valentine’s Day), Sarah Silverman (The Sarah Silverman Program, Bedwetter), Winnie Holzman (Wicked, My So-Called Life), Savannah Dooley (Huge), Aline Brosh McKenna (The Devil Wears Prada, 27 Dresses), and Kara DioGuardi (“Ain’t No Other Man”, “Walk Away”, “Undo It”), with WriteGirl founder Keren Taylor. Recording Academy & Grammy Foundation. Pictured left to right: screenwriter Elizabeth Sarnoff (honoree), actor Robin Weigert, California Poet Laureate Carol Muske-Dukes, screenwriter Robin Swicord (presenter), Lynda Resnick (honoree), WriteGirl Executive Director Keren Taylor, novelist Marisa Silver (honoree), L.A. Times Book Editor David Ulin (presenter), poet Patricia Seyburn (honoree), screenwriter Nancy Meyers (honoree), and screenwriter and WriteGirl volunteer Clare Sera (emcee).